Great customer service is huge. Without it, you will lose your business. With it, you will gain customers that will be loyal to you for life, even when there may be cheaper prices elsewhere. Be accessible. Don’t make it impossible for costumers to get your help when they need it. On your contact page, be sure to include your email address, or a form they can fill out with their question. Don’t make them give you their social security number either. Make it simple. Name, phone number, email, question. Bonus: Let them know on that form page when they can expect a response. Use a ticket system such as Zendesk to track each customer service email to be sure that they don’t fall through the cracks. When you run a small business, there’s A LOT to keep track of. Of all the things you don’t want to forget, your customers should be at the top. Create a streamlined process that will set you up for customer service success. Even if you don’t have a solution to their need immediately, respond to the customer’s email to acknowledge that you saw the email, are working on finding a solution, and will be in touch soon. Consumers want to feel valued and expect a quick response. Acknowledging their need in a timely manner will help consumers feel valued. It’s not business, it’s personal. At least it needs to be if you want to be known for your outstanding customer service. How do you make your emails personal? Write them from you, not from the computer. What do I mean? Use your customer’s name and introduce yourself. Then write the email as if you were talking to your friend about a product they loved, but were having trouble with. According to Software Advice, 65% of customers prefer a casual tone in their email. Keep in mind, while using a casual, friendly tone will work well in your responses, you don’t want to treat the customer’s problem casually. Recognize their frustration and don’t give the impression that their situation is not a big deal, or that they are being blown off. Using positive language can be incredibly powerful in changing the way your customers read your support emails. But how do you do that? It’s actually pretty simple: start by spotting negative words in your emails, and replacing them with positive ones. Try removing words like “but” and “actually”. They say attitude is everything. Give your customers a good attitude about their situation and your business by using language that will make them feel that there will be a good outcome. Now down to the nitty gritty. What do you actually do with the situation at hand? Put yourself in your customer’s shoes and treat them as you would want to be treated. Act as if that customer were your top priority. Take a page out of Callaway’s book. One of their customers emailed them, looking for a replacement grip to a putter he loved. He offered to pay good money for it and was simply looking for the actual product since the putter was discontinued. Not only did the customer service rep reply with a way for the customer to get the grip, that rep said the grip would be shipped to the customer’s home, free of charge. 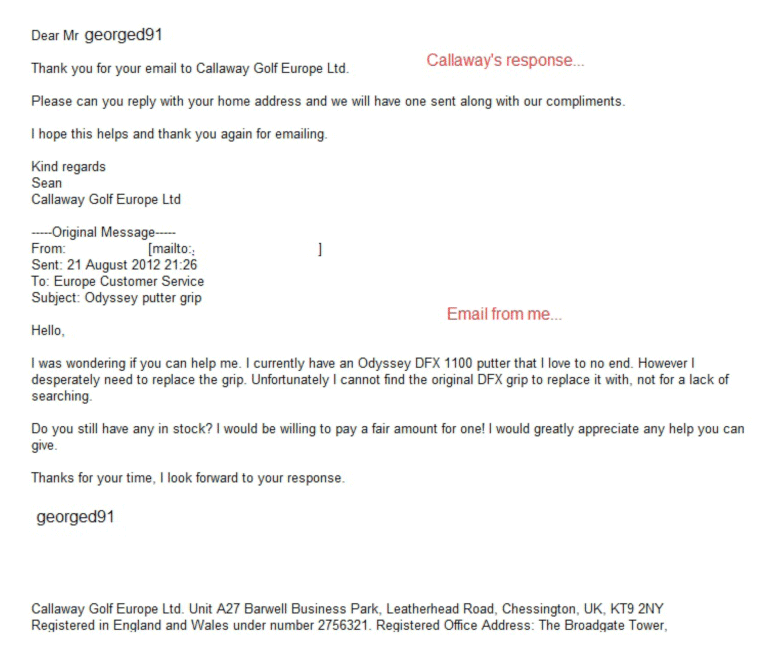 Remember the great customer service shown by Callaway? Didn’t that lose them a potential sale? The customer said he would be willing to pay a fair amount of money for a good grip. After all, Callaway is a high-end company and could charge a decent amount for it if they wanted to. But they didn’t. They chose to provide great customer service. And it paid off. ” I want to buy more Callaway products, lots more”. So, you say, that got them one great customer, so what. That type of customer service would cost us. It should be the exception, not the norm. We’d lose money. Other customers went out of their way to share their own story in comments on George’s post. There’s now a page on Reddit that lives as a loving testimonial for Callaway because of their customer service. Not only do they have great customer service, but everyone knows it. A product owner for life. That’s what you’re going for. That’s the goal. Be that company that is loved for their great customer service. And start with email. NextAre Pop-Up Ads The Right Choice For Your Website? How Can I Protect My POS System?